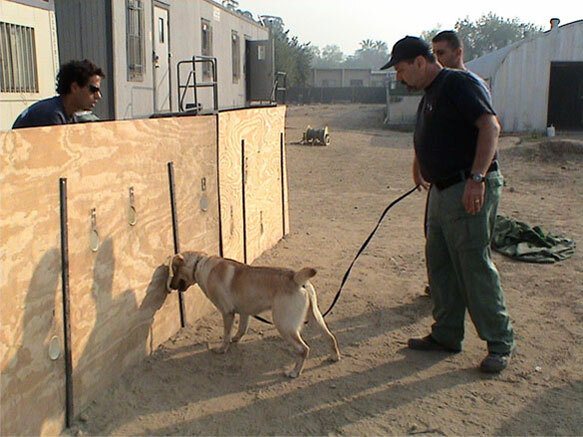 Mike has the best dogs, said Det. Joe Pau, He does things with dogs that make them head and shoulders over anyone else’s. The war on terror is having an effective impact on terrorist organizations, (ICT conference conclusion). In spite of this, potential terror is here to stay as part of our foreseeable existence. The terrorists are waiting patiently for us to lower our guard in order to strike and rejuvenate their existence, biding their time, studying the chinks in our armor, working on developing/re-developing their operational resources in order to strike effectively. Al Qeida has sent a message to terror organizations throughout the world that the U.S. is a feasible and vulnerable target. We cannot count on the status quo of our security. We must be constantly working, developing, moving forward in our capabilities to deal with terror. 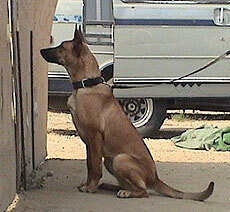 The focused alert; taught using the Herstik Wall method. 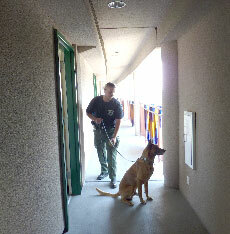 Training at the Rose Bowl, K9 alerting to hidden target material. 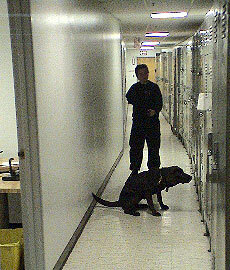 LAPD Bomb Squad K9 team, alerting on a locker.